If there's one product that American families on a budget know and love/hate the taste of all too well, it was Hamburger Helper. Hamburger was super cheap back in 1971 (not so cheap these days.) And more housewives were entering the work force. So they needed a cheap, easy to make meal that was satisfying and tasty. So the folks at General Mills created what has since become a staple in the American kitchen cupboard. However, there was a precedent. 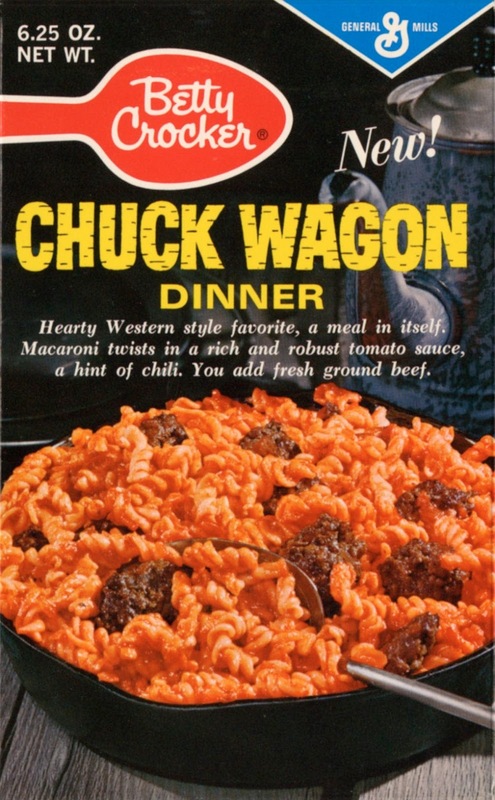 In the late 1960s, Betty Crocker had a product called Chuck Wagon Dinner. 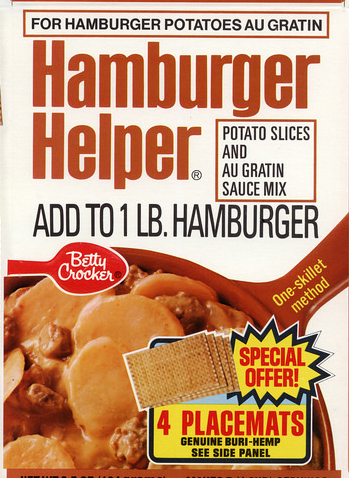 It was test marketed before new flavours came and the decision was to incorporate it all under the Hamburger Helper brand. 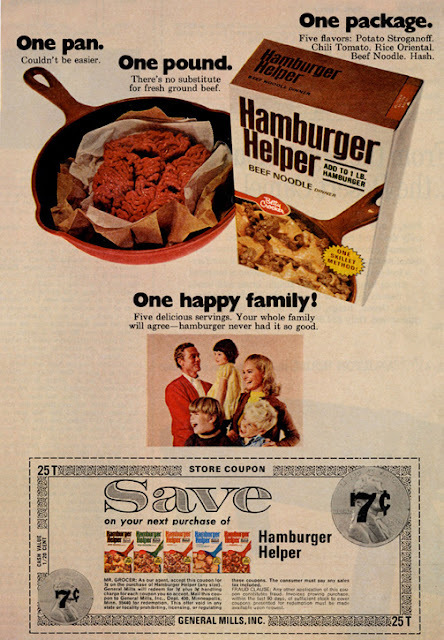 But for me personally, the smell of Rice Oriental Hamburger Helper on the stove reminds me of simpler times. And dinner with mom, watching the CBS Evening News with Dan Rather on a gigantic Montgomery Ward console TV. The Hamburger Stew was absolutely delicious. 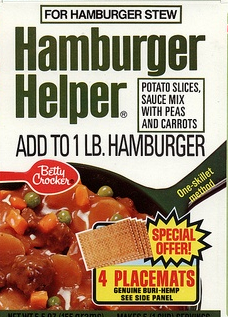 The wild popularity of Hamburger Helper spawned Tuna Helper in 1972 (which my cat loved), Fruit Helper (a dessert product) in 1973, Chicken Helper in 1984, Pork Helper appeared in 2003, Asian Helper in 2006 (which was OK, but really disappointing in the fact that Rice Oriental was not included in that line.) Pork and Asian Helper are no longer on the market and Fruit Helper has been defunct since the mid'70s. In 2013, they shortened the name to just the monosyllabic "Helper". Another one of those slick sounding, but ultimately pointless corporate 'synergy' things to tie in all it's products and subsidiary lines, I guess. But on last Friday, April Fool's Day, Betty Crocker/General Mills suddenly and quite unexpectedly threw down the The Ultimate Hip-Hop Party Jam Mixtape of '16. Lefty is the anthropomorphic talking oven mitt mascot whose image graces the boxes and appeared in countless classic commercials for Hamburger Helper. Now for my generation and older, Lefty's transformation is a bit of an, um.... Shock? But try to understand that your career options are very limited when you're an anthropomorphic talking/singing oven mitt. So you take whatever gig you can get. 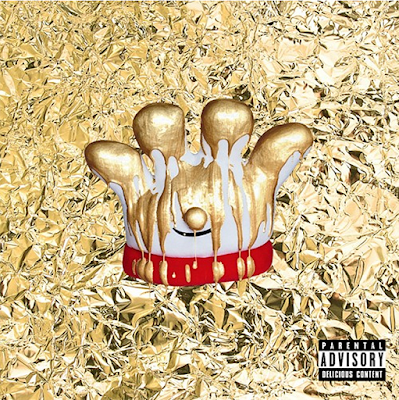 Watch The Stove Helper feat. Lefty. Listen to the entire mixtape free at Soundcloud. No word as of yet of any vinyl issues of this mixtape. It quickly went viral on Twitter. Stirring up a piping hot pan of delicious memories amongst the usual snarkiness. But more than anything else, this is actually starting to be considered a landmark album in hip-hop, receiving praise in Billboard and The Los Angeles Times. Anyway, what are you waiting for? 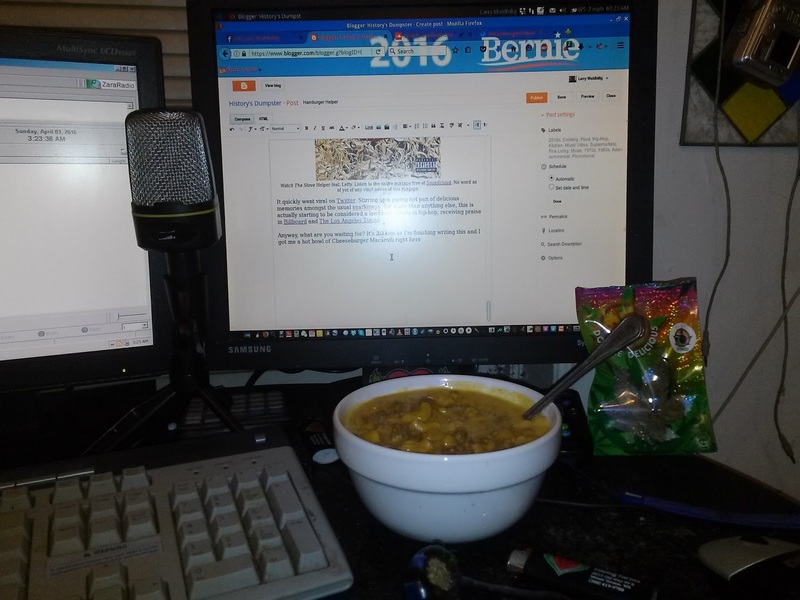 It's 3:23am as I'm finishing writing this and I got me a hot bowl of Cheeseburger Macaroni right here. Bon Appetit!